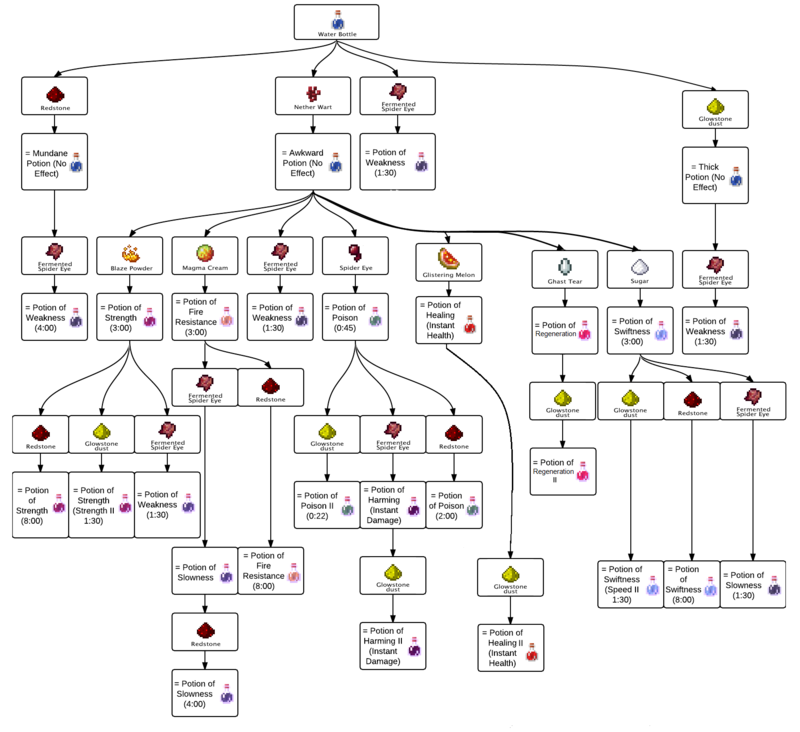 This mod allows you to create custom potions with specific functions. POTIONSPACK: Adds some cool potions, AntiGravity, AntiGravity II, Speed, Speed II, Confusion, Inversion, and Whatwillthisdo? Screenshots and video (possibly) coming in a day or 3. Last edited by Traxie21 on Wed Apr 10, 2013 21:47, edited 1 time in total. You managed to download it in the 3 minutes that elapsed between then and the fix. EDIT: I take that back, I forgot to push to the repo. Last edited by Traxie21 on Wed Apr 10, 2013 21:49, edited 1 time in total. Last edited by jojoa1997 on Wed Apr 10, 2013 23:10, edited 1 time in total. Ah good, want to add this to it? A healing and poisoning potion. A potion of nodularity, which wherever you go, you add a node to your position if it's air. A potion of acidity, which wherever you are, it removes the node below you if it's not air. A potion of limbo, which transfers you to 12000 and sets your gravity to 0, then when it wears off, transfers you back to your old position. Last edited by jordan4ibanez on Thu Apr 11, 2013 03:55, edited 1 time in total. It is technically impossible to see with a field of view => 180 (except if you're using fisheye :P). 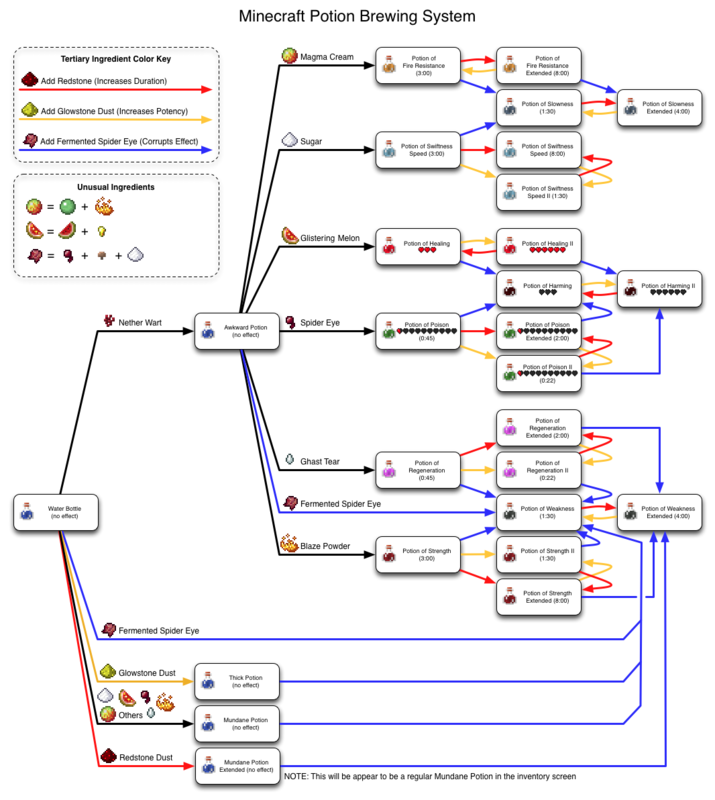 For those who wasn't to get a sense of how minecraft potions work and get ideas on potions and how they can be made. Last edited by jojoa1997 on Thu Apr 11, 2013 10:57, edited 1 time in total. Unfortunately, I have little time left this week, maybe update PotionsPack Friday. ATM you have to make your own recipes, I was having trouble with the cauldron yesterday. One is coming though, and it will be quite easy to specify a recipe for it. Potions already reset previous effects. There should be throwing potions and I think that potions should merge effects and adding a crafting recipe to the finctio. Would help. Also maybe just make the brewing stand stuff but no function to it. Oh yeah, forgot about throwing potions. Merging effects would be very complicated for some potions. HOWEVER, potions that effect player physics already merge with those that don't. The Cauldron (brewing stand) will be released once completed. Crafting recipes will eventually be as simple as adding "default:item, modname:item" to the potion definition. We need some way to know what you have on you, but I agree, it is kinda ugly. Traxie21 wrote: We need some way to know what you have on you, but I agree, it is kinda ugly. Yeah. One thing I noticed is that the particle effects fly up a lot farther then they should. Can you fix that? Another thing is they should be drinkable. 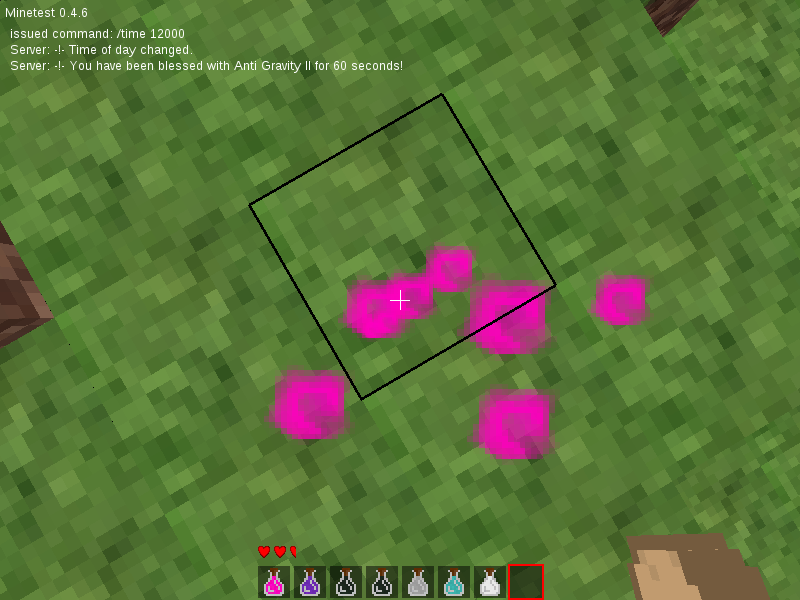 The particles should also match the color of the potions. Last edited by Evergreen on Thu Apr 11, 2013 18:46, edited 1 time in total. I wanted the particles to last for a long time, but I will decrease them. The coloring will come later, It's just a pain to make an overly for every color. Idk how to make them really drinkable, but they shouldn't use up the bottle. make it a food. i will look into it. Traxie21 wrote: I wanted the particles to last for a long time, but I will decrease them. This is how you make items. for throwing just do on use and set the velocity to ssommmmmmmmmethiiiiiiiing. look at the bows mood by pilzadaam for thhrowing itemms..
Oke, thanks jojo, I had no idea there was an actual eat function.